This program is awesome! Many thanx! Midas reported above (on 2012-07-27) that there is a portable package available. The portable package works great, and there is no need for special install instructions, other than "extract to folder and launch ..." It's a zip file, which makes it easier as well, and comes with a Readme with further instructions. I think the link for this program should be pointing to the portable version, and not the install version. Can that be updated, please? Also, the "uncompressed size" needs to be updated. It's 4.75MB for the newest portable version, not 732KB. Great program! Loving it! Much smaller footprint than the Logitech Setpoint software, which does the same thing, but at 59MB instead of 4.75. This program completely rules. 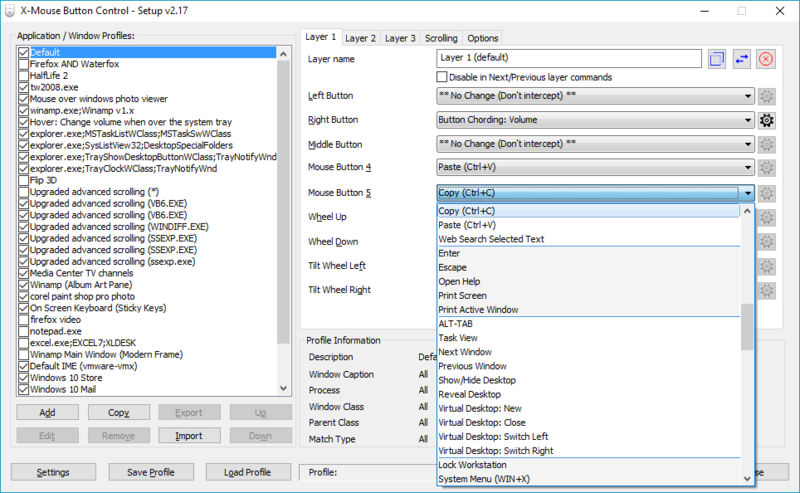 An amazing amount of features for a freeware mouse tweaking program. I have a Logitech mouse with two buttons I *never* used that now dramatically speed up my work. You know..the installer embed with x86/64 of VC9 Runtime where will mess your system. Here my simple (not thoroughly tested) v1.53 x86 portable creation. Extract the installer..then "x86.VC90Runtime.msi" file. Move XMouseButtonControl_1.exe - XMouseButtonHook_1.dll - msvcm90.dll - msvcp90.dll - msvcr90.dll to another folder. Create a Portable batch file (XMouseButtonControl.exe /Portable). Launch your batch file..and disable the "New Version check" option. Then delete "HKCU\Software\Highresolution Enterprises" key. Could you be more specific? What file is installed when and where? Is this a mouse gestures program? "Portable mode is automatically enabled if the application is not in the install location under \program files. It is also enabled if the /portable command line switch is specified."